It all happened organically, as you would expect from a 5-year-old who was fascinated watching her dad put on his running shoes. “What are you doing, Dad?” she asked. “Jogging,” he said, inviting her along. She jogged with him around the block—but it bugged her they didn’t go anywhere. She would take care of that issue later. She tolerated her first job out of college in engineering at Intel in California, but fell in love with being a triathlete, adventure racing and, after a trip to Italy, travel. She joined in on running clubs around the world and reveled in the positive and welcoming communities that wanted to show her their cities and social events. Running marathons just sort of evolved from there. To be safe, she flew back to the States to do a trial marathon in Florida. That went well, but she caught the flu on her flight back to Africa. Although the event doctor advised against running, she told herself, “If I ran a half mile, I will have tried.” Moved by the experience and culture of the people who live in the dessert, she ran all 26.2 miles and collapsed 10 feet past the finish line with a time of 6:11:05, her slowest of the eventual seven. Powered by this new test of will, she jumped in on a marathon in the Netherlands, then took on a marathon trek in the Andes Mountains in South America. 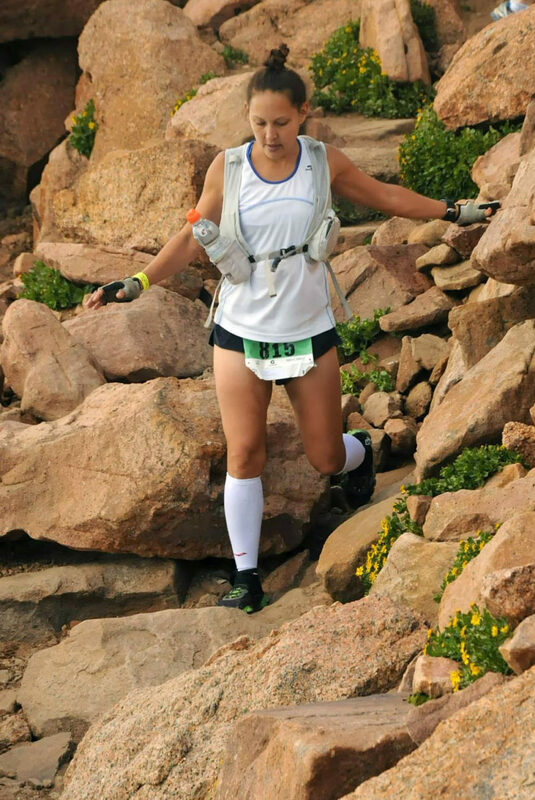 Within no time she had run four marathons on four continents. “You’re going to break a record for doing that,” a friend commented. She accepted the challenge. In 2002 the Internet wasn’t yet its reliable, wi-fi-at-every-café self yet. It wasn’t easy to locate marathons in the remaining three continents or even to track down race directors from her past races so she could document her case to Guinness Book of World Records. The Antarctica race may have been the most memorable. “When do you get to run a marathon on ice?” And an A-to-Z list of glitches from patellar tendonitis to a harrowing near miss of the flight that would get her to the final record-breaking Siberian International Marathon in Omsk (3:46:10) on time made the victory all the much sweeter. Amie’s 523-day competition of seven marathons in seven continents smashed the previous women’s record of 700 days. Her cumulative time of 34 hours, 24 minutes and 29 seconds (just one minute and 21 seconds behind Tim Rogers’ men’s record) earned her another women’s world record. And just for kicks, 30-year-old Amie made it a three-fer becoming the youngest person to complete the seven-continent challenge. Once stateside, she began work on her MBA in Bloomington, but then veered toward earning her Master’s in Journalism and started a second Master’s in Kinesiology. She just couldn’t shake the running bug and wanted to use her knowledge to help others. Two years ago, she committed to becoming a certified wellness and running coach. She tapped into her worldwide running community and launched a coaching business, helping runners from the UK to New Zealand. This summer, she has given Michiana runners a special treat as coach of two trail running programs she developed with St. Joseph County Parks, something she has truly enjoyed. “I forgot how gratifying it is to work with beginners,” she said, noting how the participants have come together as a support group, overcome medical issues and savor every time drop in their 5K times. It was inevitable Amie would discover ultra running. But that’s her free spirit talking—essential for jumping in and trying the things she does. It’s her more analytical side that gets her prepared for the accomplishments. “The more specific you are with your goals, the more specific you have to be in your training,” she said. In-season, she does a 25-minute warm-up on the treadmill before heading out on her morning run. She will walk the warm-up if it is a two-run day. Strength work in the wrong dose is too much wear and tear on her legs, so she saves most of that for the off-season. As a trainer, Amie likes to go through what her clients do, so she ran Sunburst in June and is considering a Tough Mudder. Maybe someday her clients will like to do what she does. Perhaps the Mt. Taylor Winter Quadrathlon? The grueling event is a 43-mile round-trip race where competitors bike, run, backcountry ski then snowshoe to 11,400 feet and return in reverse order. On Amie’s attempt, it was the steep ski downhill where a fall dislocated her shoulder. Painful as it was, she popped it back in place and continued on. In the last leg, the chain fell off her bike. It was doubly challenging “and extremely painful” to fix it with one arm. Head to Amie’s RunningWithLife.com website to learn more and find out about current training programs in the area.